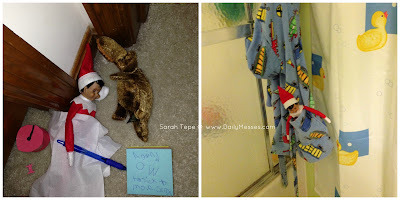 Day 4 12/7/16: Well, someone touched the Elf again, so Eugene stayed put another night. Higgins added a stuffed animal to keep him company. Day 5 12/8/16: Finally! No one touched Eugene, so he moved into the boys' bathroom to hang out.